Thanks community! 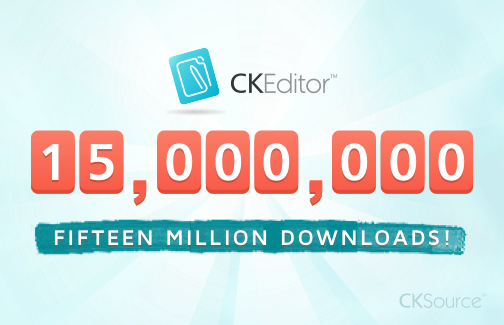 Congratulations to the CKEditor Team!!! I’m sure it is not easy to have such numbers. Especially for software like CKEditor, which in reality is not downloaded by end-users but by the heroes-in-the-middle (love! ), developers and integrators, who are responsible for including it inside their solutions. I always talk about download numbers when replying to this, because this is in fact the only really measurable variable. Last month we had 220,000 downloads. Let's say that 90% of this is not landing in any software (double downloads, testing, out of curiosity, etc). We remain with 22,000 solutions using the very last CKEditor. Let’s now say that in average each solution is distributed maximum 10 times (! ): 220,000 solution distributions. Then let’s say that each distribution has an average of 5 users (! ): 1,100,000 users! I’m not taking into consideration mass solutions using CKEditor. For example, Drupal alone is a single application used in more than 1 million websites. CKEditor is the most popular WYSIWYG solution there and it will be included in Drupal core with Drupal 8. One download in applications like this has the potential to be used by millions of users. I’m not taking into consideration all solutions which already have CKEditor and that didn’t receive an update exactly last month. Probably not even one tenth of them did so. I’m not taking into consideration that CKEditor can be downloaded in many other ways, which are not part of these statistics. For instance, our CDN stats shows 2.4 million requests *per day* (all files). CKEditor can be cloned from our GitHub repos directly. It can be installed with popular package managers like Bower. It is distributed inside platform-specific modules for different CMSs, e-commerce and blogging platforms, enterprise solutions, etc. Saying that 100 million users are using CKEditor today would not be an absurd then. I don’t think I’m the person to answer this. We should ask our users. But I can add some adjectives here that make sense: innovation, stability, quality, continuous development, trust! Hard to say. At least those are things I am proud of when I think about our project. The most important factor may be innovation. We have a growing team focused on making CKEditor unique. They are creative. They are demanding. They are pedantic. We have the best accessibility one could have in an editor. The best Paste from Word results. We produce quality content thanks to Advanced Content Filter (ACF). Complex content previously impossible to be created can now be easily produced with Widgets. A great companion file browser like CKFinder. Unique solutions like the Accessibility Checker. Wonderful documentation and a great showcase of editor features in CKEditor Examples! CKSource: a strong company behind the project, offering quality services that satisfy the demand for a complete solution. We did it well in the past. We are doing it great today. But the future will be brilliant! Right now we are releasing CKEditor 4.5. This is one of the most impressive releases of CKEditor in the last months. It introduces great unique features with the top quality on details we are used to have. Don’t miss it! We started discussing CKEditor 4.6. We’re going to make our ideas public as soon as the 4.5 goes out. We have great plans for it with focus on UX and further enhancements to the content generated by CKEditor for the modern web. This is exciting! Stay tuned! Let me stress that this success would not be possible without our beloved community. Your feedback pointing out issues and giving suggestions. Your help coding and translating CKEditor. Your participation in advocating the project and helping others. All of this empowers us and keeps us focused on delivering the WYSIWYG editor of your choice.